Gemmology is a text for students preparing for the Gemmological Association's Preliminary and Diploma examinations. The book is more expansive and up-to-date than the author's earlier book, Beginner's Guide to Gemmology. 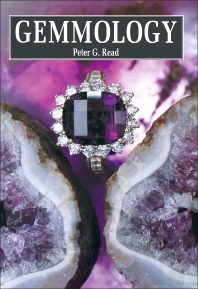 The book deals with the practical and theoretical sides of gemmology. Tracing the background and science of gemmology, the book covers the gem material, geological formation, and occurrence of gemstones on the earth. The composition of gemstones from the atoms, elements, molecules, and compounds comprising them is analyzed, and the relationship between chemical composition and durability of the stone is explained. The basics of crystallography is mentioned as a tool toward understanding gemmology after which cleavage, parting, and fracture are done. A gemstone's durability and hardness and how the latter influences engineering tests and the mining techniques are compared. An important test technique to identify unmounted stones is the measure of specific gravity using displacement measurement methods and hydrostatic methods. After more descriptive details are given in identification of gemstones, whether these are synthetic or simulants, through a comprehensive explanation of the materials found in these other gemstones, the fashioning, through shaping or polishing, of gemstones is explained. Emphasis is given on the critical angle in which light rays pass in different rock densities, and then the cutting styles, gemstone polishing, and grading are discussed. Students studying for the Gemmological Association's Preliminary and Diploma examinations, jewelers, lapidarists, and diamond cutters, as well as those engaged in the hobby of gemmology, will find this book helpful and full of information toward their endeavors and hobbies.